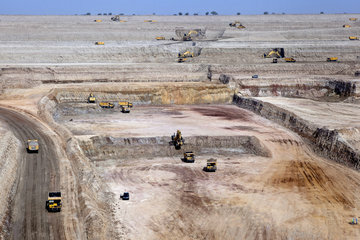 In the thirsty Thar desert, Pakistan has begun to dig up one of the world’s largest deposits of low-grade, brown, dirty coal to fuel new power stations, with Chinese investments. While the rest of the world is hopefully clamping down on coal, Pakistan is planning to increase lignite mining with five new power plants scheduled to start producing electricity by 2018 and many more in the pipeline. These plants will spew billions of tonnes of carbon dioxide into the atmosphere over their lifetime further jeopardizing the future of our planet. China has become Pakistan’s partner of choice for investment, construction and operation of these new coal-fired power plants. The China-Pakistan Economic Corridor (CPEC) is a bilateral deal between the two countries under which the Chinese government and banks will financially support Chinese companies to build USD 45.6 billion worth of energy and infrastructure projects in Pakistan over the next six years. . The coal (lignite) reserves in Pakistan’s Thar Desert spread over more than 9,000 sq/km of land and are estimated to be 175 billion tonnes in quantity. Believed to be one of the largest coal deposits in the world, Thar’s reserves are believed to be equivalent to the total oil reserves of Saudi Arabia and Iran (in terms of heating value) and can produce 100,000MW of electricity for three centuries.As Bloomberg news put it : "In the dusty scrub of the Thar desert, Pakistan has begun to dig up one of the world’s largest deposits of low-grade, brown, dirty coal to fuel new power stations that could revolutionize the country’s economy. The project is one of the most expensive among an array of ambitious energy developments that China is helping the country to build as part of a $55 billion economic partnership." To tap into this vast unexploited resource, the government has allowed Sindh Engro Coal Mining Company (SECMC) to utilise one per cent of the total coal reserves as part of the many power projects taking place under the China-Pakistan Economic Corridor scheme. With the 1.57 billion tonnes of coal that lie underground, the company aims to produce 660MW electricity by June 2019, 1,320MW by December 2019 and 3,300MW by 2022. 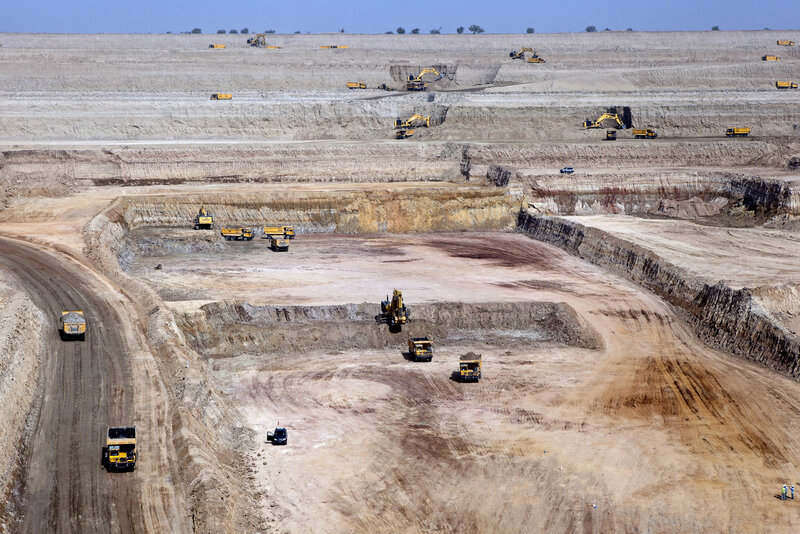 Work on the Thar coal project has begun, but SECMC is facing criticism as there are concerns regarding land rights of the people of Thar, groundwater depletion, and environmental deterioration. In order to begin coal extraction, SECMC has started to dry the mine by extracting water from the area. The extracted water has no toxic or heavy metals, but it is still not safe for drinking. The water will be transferred and stored in a large reservoir which spreads across 1,500 acres. Locals from Gorrano village, which is located right next to the reservoir, have their reservations as they have lost space for livestock grazing due to the construction of the reservoir and fear seepage from it will pollute groundwater which they are dependent on..
Indigenous Hindu minority of the areas are protesting for months against construction of reservoir. As reported in The Guardian, 27 Febr. 2017 , "as Pakistan seeks to address its power crisis by mining coal, villagers in the Thar desert are fighting to prevent state acquisition of their ancestral land. Amid the din of the excavating machines and the rumble of dumpers removing and hauling tonnes of earth, the voice of indigenous communities in Pakistan’s Sindh province has been drowned out. Nabi Bux, a resident of Sehnri Dars in the province’s Thar desert, can attest as much. 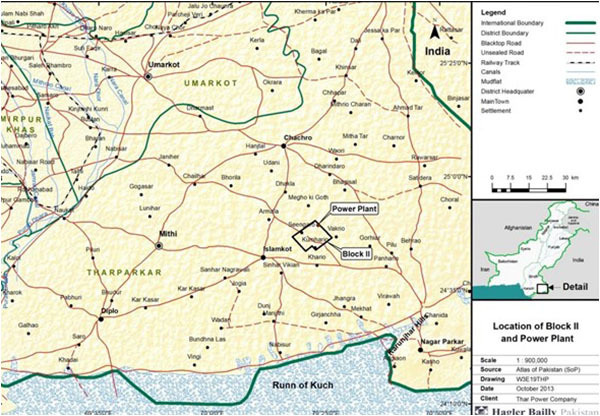 His village, roughly 400km from the port city of Karachi, has been acquired by the Sindh Engro Coal Mining Company (SECMC) and, as a result, he and about 1,800 fellow residents are to be relocated 25km away. “Engro is making brand new homes for us, but the spiritual attachment we have to our ancestral land is lost to them,” he says. “Nor can you put a price tag to it.”. The Sindh government is backing the project, under which the villagers were coerced into selling their land in the “greater national interest”. . In summer, Pakistan faces a shortfall of more than 6,000 MW – and many see coal as the only resource that can save the country from total darkness. The CEO of the company  dismisses concerns for climate change because "Pakistan’s emissions are less than 0.5% of the world total carbon emissions. In contrast our neighbour India’s carbon emissions contribute over 9%." . Many are alarmed by Pakistan’s insistence on turning to coal, however. Among them is Dr Abid Suleri, executive director of the Islamabad-based Sustainable Development Policy Institute, who likens the approach to “investing in an old gramophone”. Suleri believes coal cannot be exploited if the global temperature rise is to remain below 2C. .
of the effect a reservoir will have on their ancestral village.. The reservoir will store about 30 to 35 cusecs [a unit of flow equal to one cubic foot per second] of effluent from the coal mine over the next three years. Water wells will become polluted. The villagers also filed a complaint in the high court in June 2016 saying that the company acquired land invoking certain sections of the Land Acquisition Act of 1894, which allows the mining authority to acquire land but only after seeking permission from the landowner. “But we never granted them permission,” says Leela Ram Manjiani, a local resident who is a lawyer and is representing the villagers. The villagers do not have papers to prove it’s their land. “And those who do still have it in the names of their forefathers. To get the land transferred to their name requires a lot of money which they don’t have,” says Manjiani. “One the one side the locals are uneducated, belong to a religious minority and do not really have a voice and on the other side is a powerful entity,” says Suleri, who fears this will give the state an upper hand and the infractions of the mining company will be ignored by the state which is fully supporting the project and marginalise the indigenous people..
A report in China Dialogue in 2016  explains that a around 300 Chinese, including the engineers, miners and experts are working on the site. The Chinese team have started excavating the first pit. In the first phase SECMC will relocate five villages, which are located in block II, including Thario Halepoto village. SECMC has started paying villagers for their homes and agricultural land. SECMC's chief executive officer, Shamsuddin Ahmed Shaikh,said that the company is paying villagers above market prices for their land - 185,000 Pakistani rupees (US$1,900) per acre. However locals say this price does not take into account its high environmental value and they do not want to be relocated to the new towns, the exact location of which is yet to be decided. "We [our families] lived in this village for centuries, we spent our childhood here and our forefathers are buried here; to leave all this is very difficult," said Muhammad Hassan Halepoto, a resident of the Thario Halepoto. "We have dozens of trees on each acre of land. We feed our livestock from these trees even during droughts and also when it rains we plough our lands and get a huge amount from the crops. These lands are our permanent source of livelihood," said one villager. The villagers will also lose grazing lands to the coal project. The Thar Desert is home to 7 million cows, goats, sheep and camel. Villagers fear that the project will be an environmental disaster for the desert. The company will cut thousands of indigenous trees to make way for the mining and construction of roads, destroying the local ecology. Water sources are threatened. Project Details The Thar Engro Coal Power Project (Thar-ll) is a mining project and coal-fired power plant under construction in Tharparkar District, Sindh, Pakistan 25 kilometers from the town of Islamkot near the village of Singharo-Bitra. The project is being developed as part of the China–Pakistan Economic Corridor by Sindh Engro Coal Mining Company (a joint venture between the government of Sindh and Engro Corporation) and China Machinery Engineering Corporation in the Thar Block-II of the Thar Coalfield. According to CEO Shamsuddin Ahmed Shaikh  " SECMC has been involved in Thar for the last eight years, since 2008. For background, coal was discovered in Thar in the 1990s. At that time, the exploitation of Thar coal came under the Federal Government. Two attempts were made to invest and mine in Thar, but due to various reasons they came to nothing. Then in 2008, the responsibility for Mines and Minerals was devolved to the Sindh Government, which took the wise decision that since they could not handle Thar coal on their own, private sector partners should be involved. As a result, an international competitive bid was held and in 2009 Engro became a part of the Sindh Government’s joint venture and this led to the formation of SECMC. 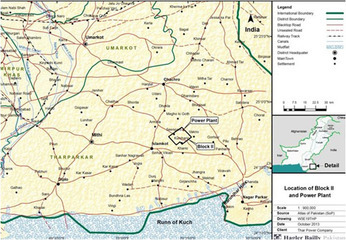 Engro and the Sindh Government pooled resources together – on a 60% Engro and 40% Sindh Government ratio – to undertake the feasibility. When this was completed in 2012, it was decided to set up a 1,200 megawatt project with 6.5 million tons per annum (MTPA) mining at a cost of three billion dollars. Then a number of factors intervened. Firstly, due to the economic situation, it was almost impossible to raise three billion dollars in Pakistan at that time. Secondly, the international commodity market went down the drain and with it the price of coal, and it was no longer economically viable to mine Pakistani coal. So the project went on the backburner. At that time Engro asked me to look at what could be done with the project. I had always been keen to work in Thar, not so much because of the coal, but because I come from Hyderabad and I wanted to do something there. After I looked at the project, we decided to redefine the project from a 1,200 megawatt (MW) one to a 660 MW one in order to make it financially feasible and to approach other companies to see whether they would partner with us in this venture. We managed to convince eight companies to join us; six were Pakistani and two were Chinese. The Pakistani companies are the Government of Sindh, Liberty Power Company, Engro Corporation, Habib Bank Limited (HBL), House of Habib (Thal) and Hub Power Company. The two companies from China are China State Power and China Machinery Engineering Cooperation (CMEC). Another positive was that the Government of Pakistan gave us a sovereign guarantee on our loan, with the Sindh Government as the primary obligator. In fact, the Sindh Government has been the backbone of this project; they have done everything possible for this company. They invested $110 as equity and spent almost $700 million providing the infrastructure, while Engro brought in the best expertise to make the project happen. The Government of Sindh-Engro collaboration has been a dream team for the development of coal fields in Thar..
Two companies were formed. SECMC (the mining company) and Engro Powergen Thar Limited (the power company). SECMC has seven shareholders; the Sindh Government with a 51% stake, followed by Engro Powergen, the House of Habib, Hub Power Company, HBL, CMEC and State Power International Mendong (SPIM) and the China State Power. Engro Powergen has four stakeholders; Engro with a 51% stake followed by CMEC with 35%, HBL with 10% and Liberty Power with five percent. The mining project at $845 million is one of the biggest mining projects ever undertaken and the power project is worth $1.1 billion. Today Engro is managing both projects, and this shows the confidence exhibited by all the stakeholders in Engro’s abilities and depth. The present government made us part of the China Pakistan Economic Corridor (CPEC), which was a great help and made the financing possible. .
Environmental justice organisations and other supporters Islamabad Sustainable Development Policy Institute. Thar Sujag Saath, Thar Voice Forum. Other "The livestock becomes highly dependent on trees. “One of the most serious environmental issues is that, at present the felling of the Rohiro tree is banned. “Also, according to the UNDP and Environment Ministry, the gugrall (Camiphera mukul), phoge (Clligonum polygonoides), rohiro (Tecoma undulata), Peeloo (Salvadora persica), Kandi (Prosopis cineraria) and Kombhat (Acacia Senegal) are threatened species." Why? Explain briefly. The lignite mining and power plant with 660MW of Sindh Engro with Chinese support and financing seems to be going ahead. There are many complaints (because of land grabbing and water pollution, and also at another scale because of climate change) against further exploitation in lignite reserves in the Thar desert. Pakistan’s coal expansion brings misery to villagers in Thar desert. China Dialogue. 12.09.2016. Coal excavation will displace thousands of people already living in poverty and deplete groundwater in a region ravaged by drough. By Amar Guriro. (Also in The Third Pole, https://www.thethirdpole.net/2016/08/23/pakistans-coal-expansion-brings-misery-to-villagers-in-thar-desert/). By Faseeh Mangi. 21 March 2017. Interview with Shamsuddin Ahmed Shaikh, in conversation with Mariam Ali Baig, fully describing the project. 30 Dec. 2016, by Zulfikar Kunbhar. Thar’s locals are unhappy with plans for a reservoir to store coal mining effluent. (Excellent article).